Donatello Redfield is a chemistry professor who taught at West Oklahoma State College in Lewis, Oklahoma. He was the only survivor of a rabid attack Amara sent to the town. As the fog approached him Donatello was struck by lightning, becoming a prophet, having been triggered due to coming into contact with Amara's power. Amara later consumes his soul in order to track down Chuck. A couple of years after becoming a prophet, Donatello planned to retire, rationalizing that with no God around, there was no need for a prophet. He planned to move into a condo in Boca Raton, but is soon drawn to the Winchesters by Jack's power. After Jack is stuck in Apocalypse World after a failed attempt to rescue Mary, Castiel and the Winchesters call upon Donatello to read the demon tablet in an effort to find another way to open a portal. Donatello translates a spell, but unbeknownst to them becomes influenced by the tablet and misleads them, trying to get them killed. Donatello's soullessness had left him vulnerable to the dark energy of the tablet, causing him to go mad. Frustrated, Castiel decides to use his power to extract the portal spell from his mind, leaving Donatello brain-dead and on life support. Over a year later, Donatello's state between life and death causes a malformed new prophet, Tony Alvarez, to be called. As a result, the Winchesters decide to take him off of life support to prevent further corruption of the prophet line, only to have Castiel realize that Donatello's mind is trying to rebuild itself. Castiel is able to use this to restore a soulless Donatello who is no longer twisted or corrupted from the dark energy from the demon tablet. "I can't be a prophet. I'm an atheist and a chemist! I-I believe in molecules, not God." After learning about Amara's attack on Lewis, Oklahoma, Sam and Dean arrive to question Donatello, who was the only survivor. Donatello describes to Sam and Dean how the fog came from nowhere and caused people to begin choking and appear with black tendrils all over their bodies. He tells the Winchesters that when the fog approached him, he was suddenly struck by lightning, and his mind began exploding with "knowledge and clarity" and visions of destruction and death. Believing Donatello has become a prophet, Sam tests him out by showing him Enochian. Donatello initially tells Sam he has no idea what the paper says before surprising himself by reading "Behold the face of God." Driving in the Impala, Donatello finds it hard to believe he is a prophet, explaining that he is an atheist and believes in science, not God. After Sam and Dean explain everything involving God, Amara, and Lucifer, Donatello freaks out and futilely attempts to escape the Impala. As Sam and Dean try and calm him, Donatello begins sensing something, believing it could be God. At the Bunker, Donatello meets Chuck, who apologizes for the death of his cat and welcomes him aboard the team and tells him not to worry about his past atheism. 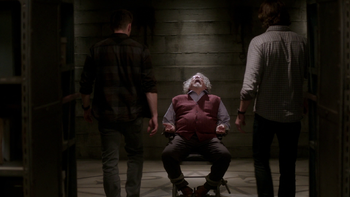 Sam, Dean, and Donatello soon meet with Metatron at the Bunker. There they formulate a plan to rescue Lucifer from Amara. A skeptical Metatron asks if they even know where to find Amara, prompting Donatello to reveal he is getting a "vibe" and may be able to locate her. With Dean being used as a distraction for Amara, Sam, Donatello, and Metatron arrive at the silo where she has been torturing Lucifer. As Metatron frees Lucifer from Amara's binding magic, Donatello senses that she is returning. Sam, Lucifer, and Donatello begin to leave, while Metatron tries to buy them time. As they are speeding off, Amara appears before them in the middle of the road. As she is about to destroy them, the Impala is teleported to the Bunker by God. Donatello's soul is consumed by Amara. Sam and Dean then see Donatello off. 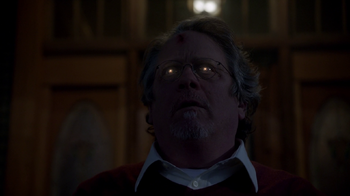 He tells the Winchesters that he is going to see what comes next, as he doesn't feel like going back to academia and he can't go back to being an atheist anymore. He thanks Sam and Dean for their help, and they tell him they may need him again down the road before he drives off in his taxi. "I don't know anything! I've only been a prophet for three days!" Three days after becoming a prophet, Donatello is back at his home in Lewis, Oklahoma, where he is being assaulted by Amara. He pleads with Amara, telling her he doesn't know anything. Amara tells him that he knows where God is, and Donatello defiantly tells her he won't tell her where Chuck is. She tells him he won't have to before clasping her hands on his face and consuming Donatello's soul, which allows her learn that her brother is in Kansas. "No soul of course, thanks to Amara. It's kinda like losing your appendix. You never really noticed it when you had it. But now, when I come to a moral crossroad, I ask myself, 'What would Mr. Rogers do?' And as soon as I nail that, I'm usually good." Arriving at Sam and Dean's motel, Donatello is immediately assaulted by the Winchesters, who are surprised to see him. Asking them if God is "here," Donatello tells Sam and Dean that he had his soul taken by Amara, but he has figured out a way to keep his moral compass, by imagining what Mr. Rogers would do whenever he comes to a moral crossroads. 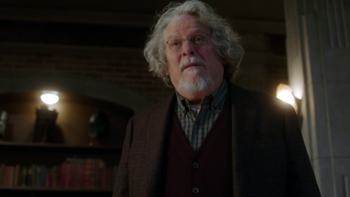 He goes on to further explain the reason he is in their motel room, telling the Winchesters of his plans to retire to Boca after his experiences with Chuck and Amara, when he was knocked off his feet by a wave of power, something that was unlike God's and which drew him to their location in Wyoming, and to Jack. Upon meeting Jack, Donatello learns he is a Nephilim and the son of Lucifer. He tells Jack he has met his father, and that the energy coming off of him is nothing like the dark and toxic energy of Lucifer. Realizing if Donatello can locate Jack, angels and demons may be able to as well, prompts them to take Jack to get wardings tattooed on his body. After Jack has an episode getting his tattoos, Sam and Dean argue about his nature. Donatello chimes in, telling Sam and Dean of nature vs. nurture, and that as a scientist he doesn't see teaching Jack as a possibility, reminding them that a lion can't not be a lion and that Jack is a human with a dose of God juice. The next morning Donatello returns to his room with breakfast burritos, only to find Sam and Dean waiting, and realizing that Jack was taken by someone that looked like Donatello. He suddenly gets a ping on Jack's location and the three get into the Impala and end up driving towards Jasper, Wyoming, where Jack has been tricked by Asmodeus, in the guise of Donatello, into opening a Hell Gate in an attempt to free the shedim. When the Winchesters and Donatello arrive, Donatello gets into a brief shouting match with his doppelgänger, prompting Dean to take a shot at Asmodeus, breaking his illusion. Asmodeus begins choking the three with a gesture of his hand, but when Jack sees Asmodeus is hurting his friends he seals up the gate and turns his attention to Asmodeus who teleports away, releasing Donatello and the Winchesters. "Chicken wings. Heavy lifting like this requires real brain fuel. My analysis of the half lives of the 33 arsenic isotopes required about 25 buckets." After learning from Castiel that the Michael of Apocalypse World opened a portal to their Earth through a spell from the angel tablet, Sam retrieves Donatello in the hopes he can find and translate a spell from the demon tablet to do the same. A bewildered Donatello arrives at the Bunker, and upon seeing the demon tablet for the first time claims the glyphs are "nearly impenetrable." When Sam asks if they can get him anything, Donatello tells him he needs chicken wings, explaining it is "brain food" for him that has helped him with heavy thinking in the past. Taking a break from translating the tablet, Donatello makes a fried chicken run and is startled by the appearance of Castiel (in reality Asmodeus). Donatello reveals he has determined that there is some kind of spell on the tablet that could open a rift and says he couldn't live with himself if he couldn't help get Jack or Mary Winchester out of the alternate universe. Asmodeus, having heard enough, shifts back to his original form and hypnotizes Donatello into forgetting their meeting and orders him to report any information to him. Donatello, in a daze, agrees and walks away. At the Bunker, Sam, Dean, and Castiel sit around discussing plans as Donatello continues his translation. When Sam notes Donatello looks to have made some progress, Donatello snaps at him before calmly telling Sam he is working his way through the ingredients. Donatello is left brain-dead after Castiel forcibly extracts information from his mind. "You know how Bibles are. Too damn many translations." While Donatello attempts to decipher the ingredients, he is corrupted by both Asmodeus's influence and the dark energies contained within the demon tablet. He misleads Sam, Dean, and Castiel by giving them a list of the wrong ingredients. While Dean and Castiel are sent on a wild goose chase to kill Gog and Magog, Sam assembles the available ingredients from the Bunker's storage area. Donatello grabs a bottle and attempts to bash in Sam's head, but Sam gets the upper hand and imprisons Donatello in the Bunker's dungeon. When Castiel and Dean return, Sam shows them a video feed broadcasting from the dungeon, showing Donatello having hallucinations and mumbling to himself. When Sam and Dean try to talk sense into him, Donatello refuses to cooperate and casts a spell on Dean to try to suffocate him and he laughs manically while Sam tries to get Dean away from him. They realize that since Donatello's soul was consumed by Amara, the demon tablet's dark energy had not been filtered out, causing him to turn on the Winchesters. Castiel believes that since they can't get his soul back, they should kill him and allow another prophet to be activated, but Sam and Dean are adamant on account of needing him to get the spell. Castiel locks himself in the dungeon where a smug Donatello continues to be disobliging, but Castiel decides to strip the spell from Donatello's mind even though it is a risky procedure. Donatello tries to cast a spell, but Castiel keeps him quiet while he extracts the spell. The event leaves Donatello brain-dead, only being kept alive by machines. Castiel reveals to Sam and Dean that when he was extracting the spell from Donatello's mind, he discovered how he had been influenced by Asmodeus into working for him. "Well, actually, I’d prefer a bucket of extra-crispy Buffalo Wings with a side of Tex-Mex sauce." After discovering that Tony Alvarez has been called as a prophet, the Winchesters contact the nursing home where Donatello is living and confirm that he is still alive in a vegetative state. Castiel theorizes that Donatello's state of being between life and death caused a new prophet to be called early, but one that was malformed. As a result, the Winchesters decide to remove Donatello from life support to prevent further problems. At the nursing home, the Winchesters, posing as Donatello's nephews, and Castiel, posing as "Dr. Novak", prepare to end his life before they are told that Donatello has begun muttering sometimes. After Sam gets a recording of it, Castiel determines that Donatello is saying the same Enochian phrases that Tony was, which is the Word of God. He realizes that Donatello's mind has begun trying to rebuild itself and organize his memories and the Words of God, rendering him no longer beyond help. Castiel is able to restore Donatello's mind, allowing Donatello to regain consciousness. As a test, Dean shuts off the life support and Donatello is shocked back to life. After having his ventilator removed, Donatello is given some grape Jell-O and asks for some chicken wings. Castiel confirms to Dean that Donatello is no longer his twisted, corrupted self, though he still lacks a soul, which Dean accepts, saying no one's perfect. With Donatello showing no memory of his time corrupted, Dean leaves Castiel to explain to Donatello what happened to him. "I am just the picture of health! Except for my prostate. It's shaped like a papaya." Worried about Jack's possible soullessness, Dean takes him to see Donatello, whom Dean calls their expert in a lack of soul. Donatello and Jack discuss soullessness in general, with Donatello describing himself like a galaxy: bring and shiny on the outside, but with a large black hole in the middle. Donatello tells Jack about the emptiness he feels, and the lack of pity, emotion, and humanity that comes with it. Jack admits that he doesn't feel nothing, but he also doesn't feel the same. Donatello tells Jack that when he wants to blend in, he thinks "what would Mr. Rogers do?" as Mr. Rogers is the best man he knows. After Jack tells him that Sam and Dean are the best men he knows, Donatello suggests that Jack think "what would the Winchesters do?" when he is unsure of himself. When Donatello leads Jack back to the Impala, Dean asks if Jack still has a soul. Donatello brings up the philosophical nature of the question before admitting that while Jack's "been around," if he says he's okay, he probably is. When Dean asks if Jack is like Donatello, Donatello states that Jack definitely is not, because Donatello is a Prophet while Jack is probably the most powerful being in the universe and it's impossible to know what is going on in his head. "I need help. You and Sam. Help me, please! Hith-'o-rehr, shqodh… ki'o-yivkha has-sa-tan, k'ar-yeh sho-'ehgh, mith-hal-lehkh, u-mvaq-qehsh 'eth asher, yval-leha'." This page was last edited on 18 April 2019, at 22:57.